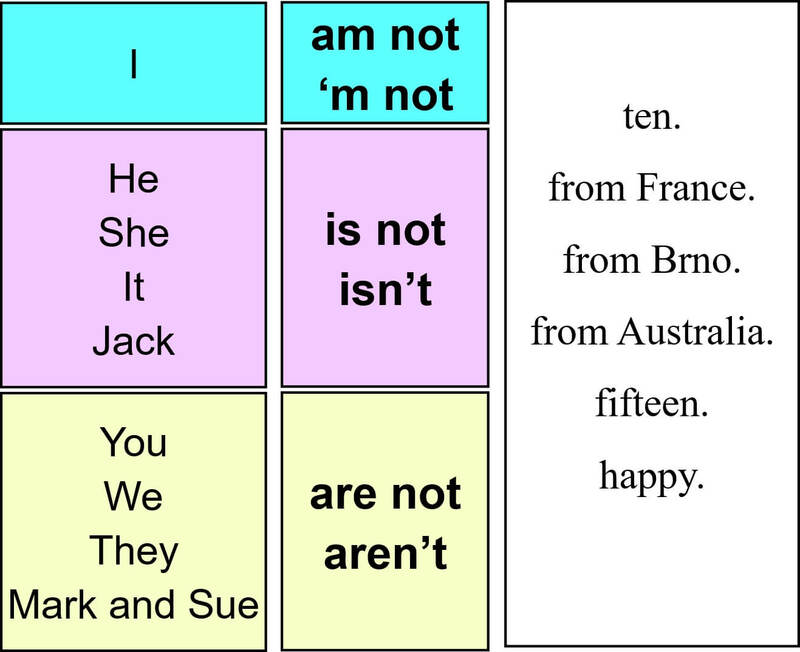 In the previous two lessons, students learnt affirmative of the verb to be. They learnt the long and the short forms so now it is time to teach the negative form of the verb to be. But before we teach anything new, it is necessary to practise what they learnt in the previous lessons. First, practise the subject pronouns in the following video. It should be easy for your students by now, so you can set the speed of the video higher, to make it more challenging. Second, repeat the affirmative using the following video. Students need to say the correct long form of the verb to be before they hear the correct answer. Third, revise the short forms using the following video. Students see a sentence and their task is to read the sentence aloud and complete it with the correct short form of the verb to be. Fourth, play the following dictation to your students. Students listen and write what they hear. The correct text will appear at the end of the video and students need to correct their answers on their own. The dictation introduces the negative forms. 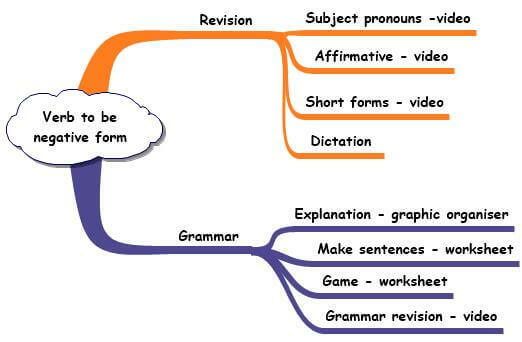 Fifth, explain the grammar using the following graphic organiser. Sixth, print the following handout and give one copy to each pair of students. Students cut the columns 1, 2 and 3 into cards. Students shuffle the cards and their task is to match the pictures to the pronouns and the pronouns to the verbs to be. Teacher checks the answers. Seventh, students cut the column 4 and put the pictures aside. They are going to play the following memory game. They turn all the cards face down. Students work in pairs and they take turns. One of the students turns three cards. If he/she is able to create a grammatically correct sentence which consists of three colours (black, red and blue), they can keep the cards. The winner is the student who collects most cards. Eighth, students watch the following video. Their task is to say the correct sentence using the negative form of the verb to be before they hear it. You can see the whole lesson in the following mind map.